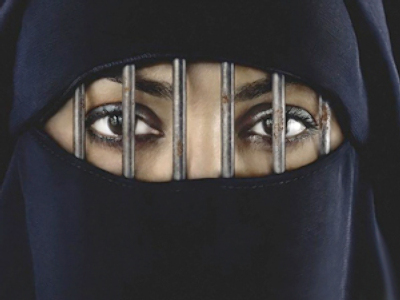 A provocative advertising campaign hitting the streets of NYC draws a line between terrorism and Islam. The PR move is the latest offensive made by critics opposing the development of an Islamic Cultural Center. Here in the US Media Capital, millions of messages flood the streets. But only one advertisement rolling through the roads of New York City draws a parallel between terrorism and Islam. The horizontal bus ad shows two images: on the left, a plane crashing into the South Tower on September 11th, 2001, on the right, a rendering of the proposed New York mosque. The text, in bold red letters, reads "Why there?" A double ended arrow connects the phrase "September 11, 2001: WTC Jihad Attack" to "September 11, 2011 Mega mosque." American Freedom Defense Initiative, a group opposing the development of an Islamic Center and Mosque two blocks away from Ground Zero, is sponsoring the month-long campaign. According to the Metropolitan Transit Authority, AFDI paid $8,000 to post the ads on 26 buses through the Big Apple. Some New Yorkers tell RT the ads promote Islamophobia and religious prejudice. "It’s inflammatory." "I think the ad is just ignorant." "I find the ad very offensive," were some of their sentiments. Those opposing the Islamic Cultural Center, known as Part 51, support the provocative PR move. "I think it’s a great ad and I think it’s an absolute disgrace to build a mosque where three thousand New Yorkers and Americans died," said one individual. In a country founded on religious freedoms, polls show 63 percent of Americans oppose the development project. Critics say Muslim-Americans shouldn't worship so close to hallowed ground, calling it insensitive to the memories of 9/11 victims. However it might be a bit too late. RT took and exclusive tour inside the 19th Century would-be Mosque building. As it turns out, the location has been serving as a place of worship for the past year. Ibrahim Hooper, a spokesperson for the Council on American-Islamic Relations, described the campaign against the mosque as a cover for anti-Muslim hatred fueled by a growing hate filled agenda. A new poll showed that 70% of people oppose the building of the mosque, showing a growth in Islamophobia. “I’ve never seen it like this. Even after 9/11 there was a reservoir of good will. There were people brining flowers to mosques that were vandalized. But really in the last few months it’s really skyrocketed,” said Hooper. Hooper argued that the controversy has been manufactured. There should be no problem or controversy, he said. It was created by groups of Islamophobes . The proposed location is already used as a mosque and prayer area. “We’re now in a situation where it’s a test case for American freedom,” said Hooper.